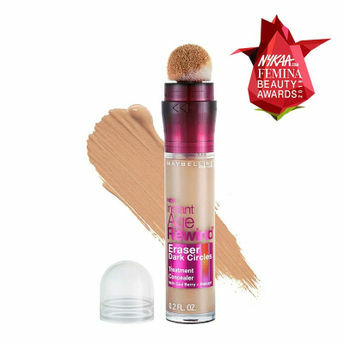 Instant Age Rewind Dark Circles Treatment Concealer by Maybelline makes the eye area appear radiant and refreshed in no time. This super-concentrated treatment concealer features a micro-corrector applicator to help instantly erase dark circles and fine lines. Infused with Goji berry and Haloxyl this concealer is a definite must-have to keep you looking fresh even after all the late-night shenanigans.